Mount Merapi is still spewing hot clouds after the eruption on Tuesday. The volcano was recorded to have spewed hot spots twice on Friday at 06.00 a.m. to 09.00 a.m. local time. “Hot clouds are still coming out that we declare the Mount Merapi status to `beware`,” the head of Geology Agency, R Syukar said here Friday. The data from Investigation and Technology Development of Volcanology Board of Yogyakarta(BPPTK) showed the first hot cloud was emitted at 06.10 a.m. at the local time for three minutes, while the second one was at 08.41 a.m. at the local time occurring for nine minutes. However, the BBPTK failed to confirm the direction of the hot clouds as the Merapi`s peak was covered with mist. Despite hot clouds, there were also 87 avalanches, 53 multiphase temblors, and 16 volcanic temblors recorded. BPPTK spotted a motionless fire hot spot at the mount peak that might lead to the formation of new lava dome. Death toll of Mt. Merapi rises to 32. 2 seriously burned people have perished from their wounds. Most of the deaths were people who did not followed the governments advice to evacuate from their houses. Identification of the heavily burned bodies was extremely difficult. Thus, the body of supposedly Mbah Maridjan, the spiritual gatekeeper of the volcano, had to be identified by his DNA. 4 rows of hot pyroclastic clouds have devastated the village of Kinahrejo on the slopes of the volcano. All houses have been burned down in this village. Reuters reported a few moments ago that at least 28 people have been killed and 14 injured by erupting Mount Merapi. Many houses have been destroyed and the slopes of the volcano are covered with a thick layer of ash. Prove of a pyroclastic flow is that some bodies were almost unrecognizable, as they were burned by the superheated gases from the volcano. The picture below gives an idea how terribly hot a pyroclastic flow can be. Th hot ash clouds are burning everything on their way. Nature but also people and infrastructure are charred. Similar pictures exist from the eruption / explosion of Mount St Helens in Whasington, United States. Left and right pictures are the same hill. Right picture was shot on October 28 after some hot ash clouds. The dead toll is climbing after the first pyroclastic cloud eruption on Mt Merapi. 25 people have lost their live so far. One of the victims was the mountain’s spiritual gatekeeper. Seismologists are unsure whether Tuesdays eruption took enough pressure from the volcano to avoid further problems. The risk of a major explosive eruption with a powerful and devastating adjacent pyroclastic hot cloud is still present. They are continuously following the tremors and are analyzing gases to predict the state of alert. It can take many more days before the people living on the volcano slopes are allowed to return to their houses. Indonesia’s volcano in dessely populated Central Java erupted on Tuesday afternoon, spewing hot ashes, pushing thousands of people to evacuate, head of volcanology monitoring unit at Volcanology Afgency Muhammad Hendratno said. Mount Merapi of 2,968 meters high erupted three times, the first eruption was at 17:02 p.m. Jakarta time (1002 GMT), Hendratmo told Xinhua. Local television reported one baby died after suffering from respiratory problem and 20 others suffered from serious injuries from hot ash. 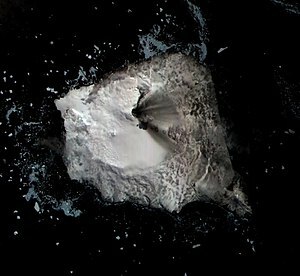 Hendratmo said that the eruption was the beginning of the eruption phase. Observer at monitoring post for Mount Merapi in Sleman district of Yoyakarta Heru Saparwoko told Xinhua by phone from the district that the cloud had hampered them to monitor how far the hot ash has spread. “We will keep monitoring the peak of eruption,” he said. The television footage footage displayed thousands of panic residence rush to leave the dangerous area by car or other vehicles to take shelters in baracks. Lava from Mount Merapi in Central Java began flowing down the Gendol River over the weekend, signaling an eruption could be imminent, a geologist said on Sunday. 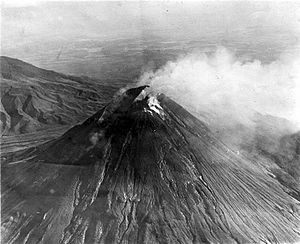 The volcano, one of the world’s most active, last erupted in June 2006 shortly after the Yogyakarta earthquake, when a pyroclastic flow, or a fast-moving cloud of superheated gas, ran down its slopes and killed two people. Pyroclastic flows can be devastating for goods and all living creatures near the eruption crater. But Surono, head of the Volcanology and Geological Disaster Mitigation Agency (PVMBG), said the distension of the mountain’s slopes was much more rapid this time around, indicating a higher-pressure build-up of gas and hence a much more explosive eruption. “We believe Merapi will erupt explosively, as it did in 1930, and not just spew gas like in 2006,” he said. The eruption in 1930 wiped out 13 villages on the slopes of the mountain, killing around 1,400 people. Merapi volcano lies the backyard of Jogjakarta, one of Indonesia’s most important cities. Armand Vervaeck, host of this blog, has climbed Merapi volcano a couple of years ago and witnessed the crater rumble from first hand. A truly fascinating volcano. We encourage reading the full article by clicking on this link. On 29 August 2010, the volcano experienced a minor eruption after several days of rumbling. Ash spewed into the atmosphere up to 1.5 kilometres (0.93 mi) and lava was seen overflowing the crater. The volcano had been inactive for centuries with the most recent eruption occurring in 1600. 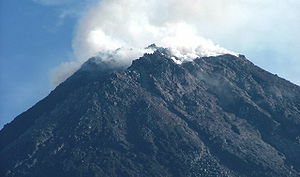 Mount Sinabung is classified as category “B” volcano, which means it is not necessary for it to be monitored intensively. Other volcanoes, in category “A”, must be monitored frequently, the head of the National Volcanology Agency, named only as Surono, told Xinhua over phone from the province. The Indonesian government was reported to have evacuated around 17,500 people from the region on and around the volcano. The government issued the highest-level warning for the area, which was expected to remain in force for around a week, since scientists were unfamiliar with the characteristics of the volcano, due to it having been dormant for so long. The government has also set up kitchens for refugees to have access to food, and have handed out 7,000 masks. Over 10,000 people have been internally evacuated after the eruption, Secretary of the provincial administration, Edy Sofyan told Xinhua by phone. Spokesman of National Disaster Management Agency Priyadi Kardono said the eruption had not been predicted earlier like other volcanoes and authorities must conduct a quick preparation for emergency work as mount Sinabung’s seismic activity has been monitored intensively only since Friday after it showed an increase in activity. Authorities are reporting different numbers of evacuated people. Latest numbers vary from 19,000 to 30,052. Red Cross Indonesia is reporting diarrhea epidemics in several evacuation camps, due to a lack of clean water. Red Cross Indonesia is doing a great job in distributing medical supplies and setting up public kitchens. Complaints are growing that not all villages at risk have been reached by humanitarian aid workers. As the roads are still in good shape, local people do not understand why the aid did not reached these critical areas so far. Some people still remain in the affected villages as they did not like to leave their houses. Police and army have been deployed to facilitate the aid efforts. Only flights from Medan to Sibolga have been chut down. Authorities are waiting for the ash clouds to disperse before allowing flights again. 10:30 UTC – August 31 : Some villagers are reducing the risk of the volcano and are heading home again. As people have their own risk scale, they are eager to go back to their fields to do what is necessary to spare their crops and to safeguard their possessions. The volcano is still active, but as the smoke coming out of the crater is grayer, they y-think the danger has reduced too and they are taking the risk. Authorities are allowing the people to go back to their homes if they decide so.